Is your toddler walking on tippy toes? If yes, then watch out! We were alarmed by our son's physiological condition maybe more so than other parents as our friends' son had to wear special braces on his feet for a year to correct his walking. He was also walking on his tippy toes all the time. Luckily, the problem can be easily corrected in most cases if detected early on by stretching and strengthening specific foot joints and muscles. Our paediatrician gave us a referral to see a neurodevelopmental physiotherapy specialist, and only because we requested it. Granted, it is difficult for a doctor to guess that a child still walks on his/her tippy toes, but may be it should be part of the routine check-up/milestone questionnaire at age 2. I have to admit that I'm becoming more and more skeptical about what doctors really know and their medical treatments for our children. 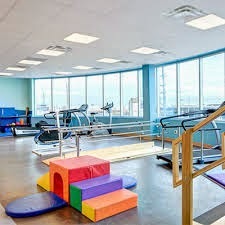 We were referred to the Boomerang Health Clinic in Vaughan which is affiliated with Sick Kids. As we arrived at the clinic, I was amazed at the huge space dedicated specifically to little people. Amongst the coolest toys in the waiting room are 8 or so iPad mini stations. Our little guy quickly climbed up on one of the chairs and launched his favourite Elmo app. Then there are big foam chairs and pillows, and clever magnetic puzzles for the kids to explore. But I'll leave the discussion on modern e-toys for another day. A young and friendly professional greeted us and walked us to the physiotherapy room (space) where she would assess our son's condition. The room was like an indoor playground, and our little monster was absolutely mesmerized. Heather* quickly explained the different reasons why a child may be walking on tippy toes. In most cases, it is due to the fact that the child is very muscular and his joints and muscles required to walk on flat feet have not been stretched enough for him/her to do that; therefore, physically the child cannot walk on flat feet even if he/she wanted too. This is our son's case. If it is detected early on, it can easily be corrected by doing specific stretching exercises on a daily basis and allowing the child the time to get into the habit of walking on flat feet once the movement of the necessary joints and muscles is there. The later the condition is detected, the longer and more challenging it is to correct it. Heather measured the degree to which each foot is able to stretch and determined with confidence that the required muscles/joints need to be stretched much further. She showed us the specific stretching and strengthening exercises to do on a daily basis and advised us to give our son whatever toy he wanted (iPad works great and that is what they use at the clinic) just for him to stay calm and let us perform the required stretching on him. She told us that it will take at least a couple of months for the muscles to stretch and then several more for him to adjust to the new way of walking. We now have follow-up appointments every month at the clinic and see some improvement, but there is still a long way to go. What's challenging about this condition is that if a child goes through a growth spurt, the muscles may tighten up again and you're back to zero, needing to restart the stretching exercises again. Another reason, in very rare instances, why a child may be walking on his/her toes, is neurological where a brain doesn't send the necessary signals. Apparently, this is extremely rare, and other symptoms related to a cognitive (mental) disorder would usually present themselves as well. So if your child is toe walking long after s/he learned to walk, make sure to consult your healthcare provider, and if necessary, learn the required stretching and strengthening exercises to correct the problem as soon as possible.